Streamlining MTBF analysis with rapid data entry and accurate calculations. Relyence’s Reliability Prediction software supports the worldwide accepted standards for MTBF prediction analyses: MIL-HDBK-217, Telcordia, 217Plus, ANSI/VITA 51.1, China’s GJB/z 299, and NPRD/EPRD. All facets of the standards are supported including part stress and parts count calculations, hybrid modeling, early life dropout, and the use of laboratory, test, and field data. Our reliability calculation software is designed to make the task of doing MTBF predictions easy, straight-forward, and accurate. Our failure rate calculator tool is fast and precise, using optimal default data as needed to perform calculations. It’s built to handle your continual product development cycle from early stage with minimal input to late stage when detailed design parameters are known. Relyence Reliability Prediction offers a robust feature set to provide all the capabilities you need for comprehensive prediction analyses. 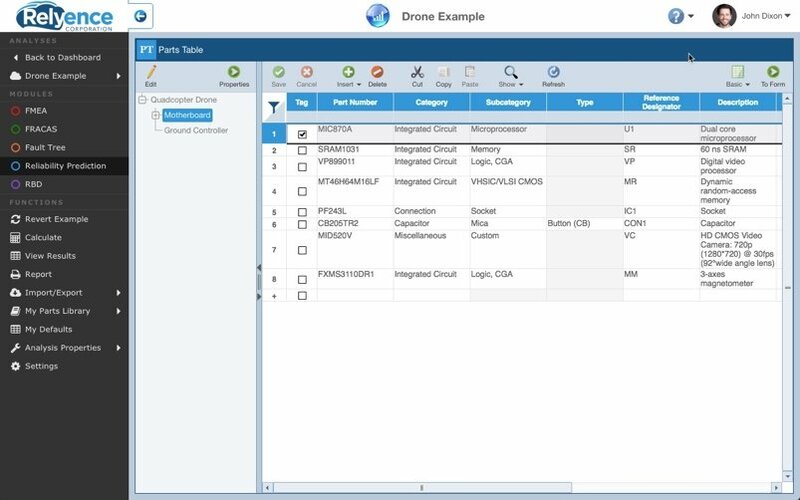 A few of the long list of features includes supplied part component libraries, BOM importing, What-If? analyses, visual system modeling, cross-module integration, flexible report generation, graphical dashboards, API functionality, and much more. Why Choose Relyence for Your Reliability Prediction Analysis Software? Fully supporting the worldwide accepted standards for prediction analyses – MIL-HDBK-217, Telcordia, 217Plus, ANSI/VITA 51.1, and China’s GJB/z 299 – and adding features such as NPRD & EPRD support, dormancy, mission profiles, pi factor viewing, and failure rate adjustments based on laboratory test and field data, Relyence’s MTBF software is your complete prediction analysis package. Relyence offers data entry mechanisms to allow for rapid analysis backed up with an efficient reliability calculation engine to perform fast and accurate failure rate and MTBF calculations. With supplied device libraries, support for creating your own custom libraries, and mixed modeling features, Relyence’s MTBF software makes quick work of your prediction tasks. Along with supporting your core MTBF analysis functions, Relyence’s Reliability Prediction software is enhanced with a long list of features to make your prediction activities efficient and effective – data importing and exporting, supplied component part libraries, dashboard overviews, customized reports, mission profile support, what-if? analyses, an API interface, and much more. Take us for a test drive. No commitment, no hassle. Just sign up today to see Relyence Reliability Prediction in action. Our two-week reliability prediction free trial requires no download or installation, and includes all the features and functions of our complete analysis platform. Or, if you’d like a personalized demo, feel free to call our team today to schedule a time. You won’t be disappointed! Discover the unparalleled features that make Relyence the choice platform for MTBF software. Relyence Reliability Prediction fully supports the most widely known and accepted standards for performing reliability prediction analyses – MIL-HDBK-217, Telcordia, 217Plus, ANSI/VITA 51.1, China’s GJB/z 299, and NPRD & EPRD – and allows for mixing models for more accurate predictions. Relyence’s MTBF software includes a component library containing hundreds of thousands of parts from known manufacturers, and also incorporates NPRD and EPRD data. In addition, you can create your own parts library. Auto lookup and our flexible search feature round out library capabilities. 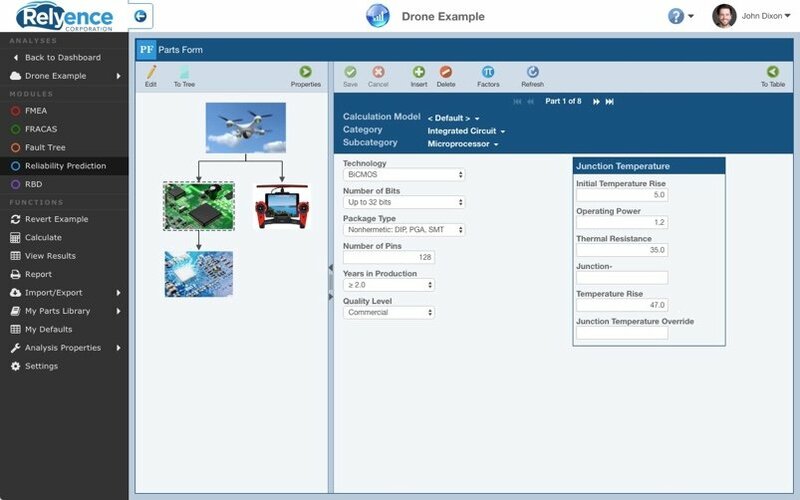 Our software goes beyond the core prediction standards by encompassing a host of features to support full system modeling: visual block diagrams creation, mission profile calculations, support for dormant cycles, and hierarchical product definition for failure rate roll up. One of the important advantages of MTBF predictions is the ability to perform What-If? and trade-off analyses. The Relyence Reliability Prediction software has built-in support for What-If? analyses for fast assessment of design alternatives that best meet your reliability objectives. The Relyence Reliability Prediction software offers a number of features for rapid data entry: built-in default values to allow calculations with minimal input, customized default settings, instant pi factor viewing, easy step-up from parts count to part stress analyses, and more. API functionality, data importing and exporting capabilities, flexible report generation, and integration to other applications are just a few of the powerful features that enable Relyence Reliability Prediction to be easily integrated into your existing systems. The Relyence Reliability Prediction Dashboard gathers and organizes your data for a holistic overview. View component failure rates, temperature and environment graphs, first year dropout, and much more with a complete set of customizable dashboard widgets. Built with team concepts in mind, Relyence Reliability Prediction software for MTBF analysis allows access to your data anytime, anywhere, and on any device – including your mobile devices. Collaboration and connectivity are at the heart of our MTBF software solution. Relyence Reliability Prediction software is also available as part of the Relyence Studio Platform – our fully integrated platform for all your reliability tasks. Data integration is seamless and cross-module dashboards provide an all encompassing overview. A Reliability Prediction is a way to analyze an electro-mechanical system to determine its predicted failure rate. Sometimes Reliability Prediction analysis is referred to as MTBF analysis. MTBF (Mean Time Between Failure or Mean Time Before Failure) and failure rate are related metrics in reliability engineering. Learn more about MTBF. Reliability Predictions take into account all the components in your system along with design and environmental parameters known to effect reliability such as operating stresses, temperature, environment, and procurement quality level. A Reliability Prediction analysis uses underlying mathematical equations developed based on historical and known failure metrics to compute a predicted failure rate of your product. 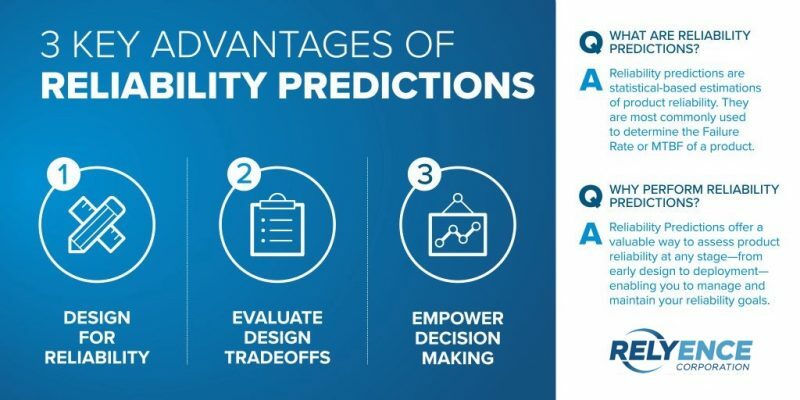 One of the main advantages of reliability predictions is that they can be performed during the product design stage, enabling you to preview likely reliability metrics prior to manufacture and deployment. This enables you to design-in reliability, so you can be confident your product will achieve your reliability and quality goals when built. In the product lifecycle, the cost of correcting a failure dramatically increases along every stage of a product’s life. In early design, design changes incur minimal cost: engineering time associated with the redesign. Design changes required later to correct defects incur huge costs – manufacturing line downtime, recalls, product replacement, etc. – not to mention the immeasurable negative costs to your reputation and corporate standing. Reliability Predictions are a fundamental and proven approach for early reliability assessment. Reliability Predictions also provide a way to perform What-If? analyses. What-If scenarios allow you to quantifiably measure the reliability of various design alternatives. For example, you may have two proposed designs for a specific subsystem. Using Reliability Prediction MTBF analysis, you can view the reliability profile of each design and make a decision based on clear metrics. Lastly, Reliability Predictions may be performed to meet compliance requirements. In some situations, vendors may be contractually obligated to meet specific MTBF goals. Armed with MTBF assessments from Reliability Prediction analyses, your compliance requirements can be attained. Check out our blog post for more about the benefits of MTBF analysis. Although it is possible to perform Reliability Predictions by hand or with simple Excel spreadsheets, the most efficient way is to use a Reliability Prediction software package designed and built expressly for this purpose. Reliability Prediction software should support the most commonly used and accepted standards, and the most recent editions of those standards. Widely used standards for Reliability Predictions include MIL-HDBK-217, Telcordia SR-332, and 217Plus. Each standard varies and also has its own unique set of features to augment and improve MTBF analysis, such as adjustments for laboratory and field-based data. Reliability Prediction software should implement each standard fully. It’s even better if the Reliability Prediction package allows you to utilize these additional features across all standards for improved MTBF predictions – referred to as model extensibility. Want to learn more about MTBF? Whether in the commercial, military, medical, or any other industry sector, when tasked with predicting the Mean Time Between Failures (MTBF) of electronic and mechanical equipment, the professionals trust Relyence reliability prediction software. From reliability managers in defense and aerospace companies to quality engineers in commercial manufacturing, Relyence is the tool of choice for easy-to-use, secure, and accurate reliability calculation software. When it comes to reliability prediction analysis, you can’t afford to take any risks. You need nothing short of a best-in-class solution with all the capabilities you require, tailored to your specific needs. Relyence reliability prediction software offers all of this — and more. When you choose Relyence, you get more than software solutions — you get an entire team dedicated to your success. You’ll have access to industry-leading support in the form of jump-start implementation, online or in-person training, and unparalleled responsive technical support throughout the lifetime of your product. 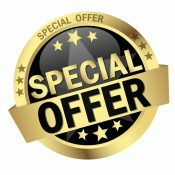 And we’re so confident that your investment in Relyence will pay off that we offer a full money-back guarantee! 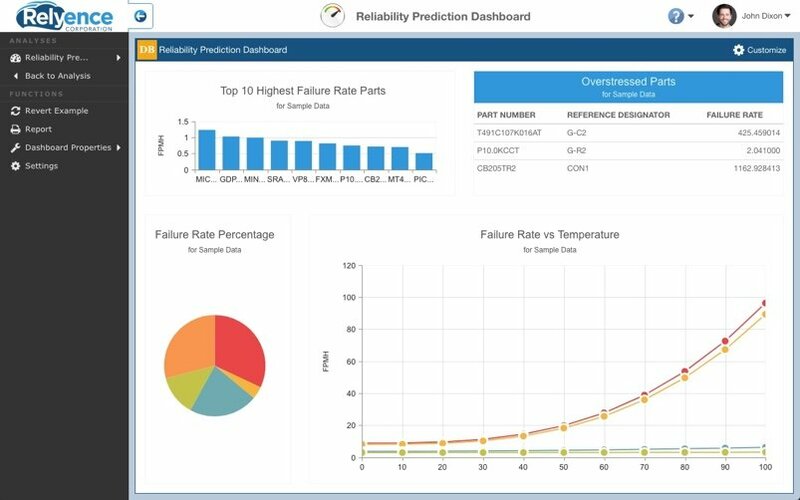 Check us out today with our reliability prediction software free trial — no strings attached. There’s no need to wait. You can start your free trial today! Check out our blog for more information on reliability predictions, Relyence Reliability Prediction, and other reliability & quality topics. Why wait? Get your no-hassle free trial! 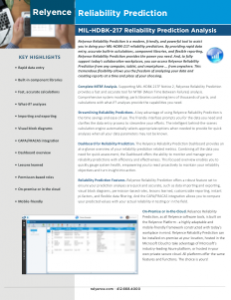 Why wait for access to today’s most powerful tool for reliability prediction? With the Relyence’s reliability prediction software free trial, you can gain instant access to our high-powered failure rate calculator, along with a comprehensive feature set to help make your job easier, less time consuming, and, above all, streamlined, accurate and efficient. Get the features accuracy you’ve been looking for in a product designed around the way you work.